That is it. These sound very generic and I would hate to lose this tree. I am not even sure if it is supposed to be indoors or outdoors. Any help is appreciated. It is a juniper tree and it needs to be outdoors all the time, all year. They die indoors. Do NOT keep watering tray full. That isn't even supposed to BE a watering tray; it's supposed to be a humidity tray. That is, it is just supposed to keep a little humidity in the air around your bonsai. Your bonsai pot should sit OVER, not in the tray. The pebbles keep the tray elevated out of the water. But really humidity trays are for indoor trees, since indoor air is very dry. You will be keeping your juniper outdoors, so you don't really need the tray, though as long as the pot doesn't sit in the water, it wouldn't hurt anything. If those rocks are glued on, they have to come off, even if you have to chisel them off. Otherwise they help kill the tree. This thread: viewtopic.php?f=36&t=1479 has general introduction to bonsai care, starting with how to water. You can decide how to shape your tree as you go along. That is the whole point of the creative art of bonsai. If you never modify it, then it is just paint by numbers. But don't do anything until you get to know your tree and have learned how to take care of it and keep it alive in its tiny pot. You will soon need to repot your tree, separating roots, cleaning the pot, and giving it good bonsai soil. 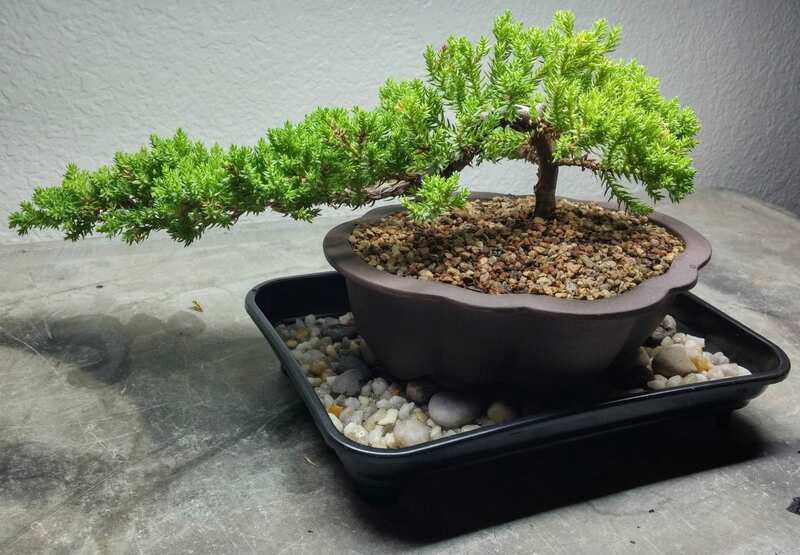 Mass produced bonsai are almost always in soil that is wrong for them. They are put in very moisture holding peat-heavy soil, so that they won't dry out in transport and on the shelf. You want your bonsai in very mineral free draining soil. But again, read and learn first and then repot. Understand that these are sometimes known as "mallsai," that is mass produced rooted cuttings. It will have hardly any root system. Like poinsettias and mums that are sold in the fall in full bloom, they are expected to be disposable and die. If you are willing to study and learn what you are doing, you may be able to rescue it. Otherwise it will be just live and learn. Thank you very much! I will make sure to get the rocks off the top and find a place for it out on the back patio. Right now, I have it sitting in the garden window and I misted it. It is next to a moon cactus.